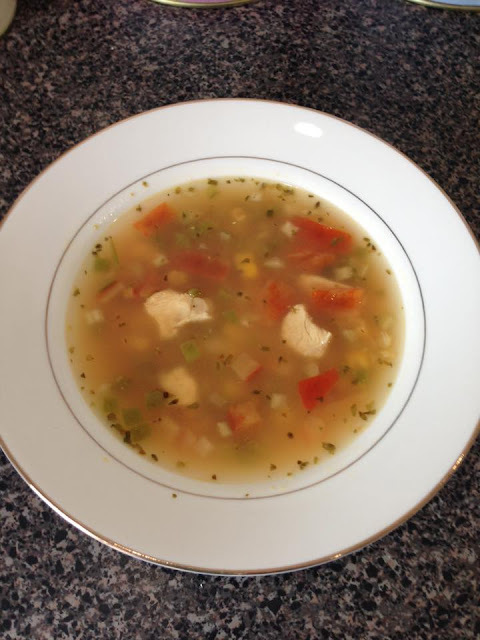 We love this Healthy Chicken & Rice Soup! It's easy and fast to make for dinner. I always have the ingredients in my pantry to make this anytime! It does have a little "kick" with the green chili peppers, so if your family doesn't like spicy, then maybe add 1/8 cup instead. You can also make this as a "Meals in a Jar meal". Contact me to learn more! I have a facebook page for my Meals in a Jar classes. Sweat butter and garlic together in a 3–4 quart sauce pot until butter is melted. Add water, then all remaining ingredients and bring to a simmer for 6 minutes. To make as a Meals in a Jar meal. ~Just layer all DRY ingredients in a quart size jar. ~Add an oxygen absorber or seal with a food saver.